Traffic in the Houston area is notoriously hazardous. When you can’t avoid a high-traffic hour because you need to get to work or get your kids to school on time, you have good reason to worry about safety and delays from accidents. Some of those accidents can cause serious injury or even death, as we can see from a recent accident on Highway 290, near Barker Cypress. An 18-wheeler was hauling a trailer full of apples on Tuesday, early in the morning, when it hit a guard rail around 12:30 AM. 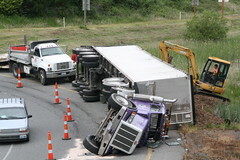 The tractor-trailer rolled onto its side and burst into flames, leaving the apples to spill all over the wreck. The driver was trapped in the cab and dies, while a passenger was thrown from the vehicle and was later taken to the hospital. Later the same morning, the accident snarled traffic. Even though authorities originally hoped to have the accident scene cleaned up by about noon, they weren’t able to leave the location until 6 PM. The diesel the spilled onto the road was a major part of the delays. Traffic was jammed for miles. In addition to the cleaning of the trucks and the road itself, the authorities had to make some repairs on the freeway in order for traffic to continue in a safe manner. Even large trash containers had to be brought in for the cleaning and repairs. If you’ve been in a car accident, no matter the circumstances, and have suffered personal injury from the accident, you may be entitled to you need expert counsel to make sure you’re case is represented in the right way. Even before calling your insurance, call us as Houston Accident Attorneys for a free consultation.